A stellar example of the work of astrophysicists. This figure is a time-lapse movie from infrared light detailing how stars in the central light-year of our Galaxy have moved over a period of 14 years. The images were captured using one of the Paranal Observatory's very large telescopes in northern Chile with a sophisticated infrared camera. The stars are moving under the influence of the enormous gravity of an unseen object that must be extremely compact -- a super-massive black hole thought to have the mass of 3 - 4 million suns. They really get whipped around that central spot. The deep near-infrared image in the figure below shows the crowded inner 2 light-years of the Milky Way with the exact position of the galactic center indicated by arrows. That is where the action is occuring. 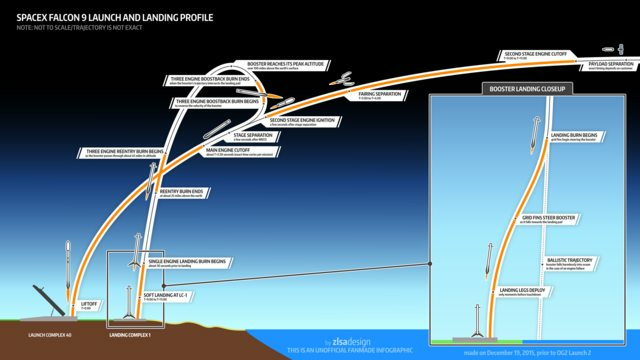 After a launch to put multiple communications satellites into space the Falcon 9 first stage was successfully landed. After a few fails SpaceX finally lands it's first stage rocket successfully on a barge floating in the ocean. The Sloan Digital Sky Survey uses a telescope to map the objects in the sky. Located at the Apache Point Observatory in New Mexico, it gathers about 200GBs of data per night. Data collection began in 2000, and the lastest imaging data release covers over 35% of the sky, with photometric observations of around 500 million objects and spectra for more than 3 million objects. The video below is a computer animation that uses images of galaxies along with spectral data from the survey and locates them in relative position to one another. The video moves through a "near" slice of the universe and depicts about 400,000 galaxies (Note that there are estimated to be a couple hundred billion galaxies in the known universe -- so for every galaxy shown in this video there are another 500,000 that are not depicted). Typical galaxies are comprised of 100-200 billion stars and who knows how many planets. 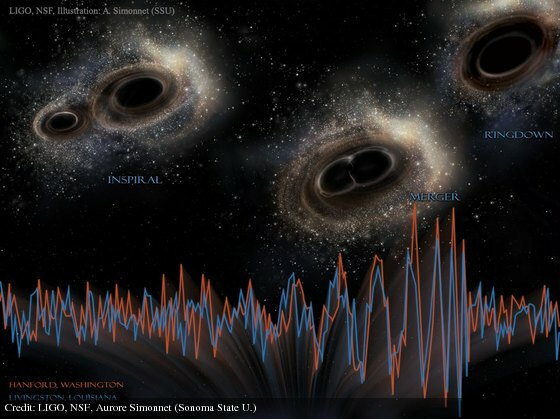 Almost one year ago a gravitational wave was measured for the first time. It was announced earlier this year after the scientists involved made sure it was the real thing. Einstein predicted the existence of gravity waves 100 years ago, but thought they would never be measured because they are very very weak. The wave that was detected was generated by the collision and merger of two "black holes" that occurred more than a billion years ago. The black holes were each about 30 times the mass of the sun and they were orbiting each other briefly at about half the speed of light and then collided. The waves have been traveling through space since that time and reach the earth last September. I have been reluctant to post this story because it is has a number of complexities to it. However, it is actually a really big deal in science -- of the magnitude of the detection of the much ballyhooed Higgs Boson particle. It is a totally new way to explore the cosmos. Since the initial wave, at least one other detection has been confirmed. Quote: In Einstein's theory of general relativity, gravity is treated as a phenomenon resulting from the curvature of spacetime. This curvature is caused by the presence of mass. Generally, the more mass that is contained within a given volume of space, the greater the curvature of spacetime will be at the boundary of its volume. As objects with mass move around in spacetime, the curvature changes to reflect the changed locations of those objects. In certain circumstances, accelerating objects generate changes in this curvature, which propagate outwards at the speed of light in a wave-like manner. These propagating phenomena are known as gravitational waves. The collision of two black holes is one of the extreme events that can produce a significant gravitational wave. 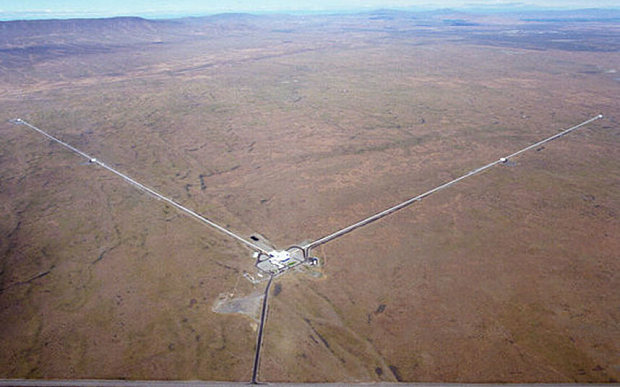 Pictured below is the Laser Interferometer Gravitational-Wave Observatory (LIGO) in central Washington State. A second LIGO site is located in Lousianna and the gravity wave was detected by both observatories, providing confirmation that the signal was not just a local event (e.g. a small earth tremor) or a system error. The wave was so strong and so perfectly matched the predicted waveform that the researchers initially thought it must be a test signal. The two LIGO facilities in the U.S. are essentially identical. The are considered to be the most precise measurement devices ever constructed. There is a central facility with two arms that each extend out 2.5 miles. Laser beams are sent to the end of each arm and reflected back, and then combined and sent to a detector. They are set to be perfectly out of phase such that they cancel each other out (like noise cancelling headphones). What is typically detected is just noise from a truck rumbling by or other seismic activity. When a gravitational wave goes through an arm (and the earth) it distorts space such that the arm is actually shortened or stretched, changing the distance each beam travels. As a result the laser beams will be ever so slightly out of phase with one another in a way that is characteristic of the event that caused the wave. The ridiculous thing is that the spatial distortion in the arm length is only a small fraction of the diameter of an atom (a small fraction of the width of a proton). Computers sort through the signals, which is usually just noise, to pull out the waveforms they are looking for. While it is a behind the scenes activity, predicting the nature of distortions in spacetime that characterize a wave generated by a specific event is a daunting task. Supercomputers are cranking away as you read this to find models that fit for various kinds of cosmic events that would generate measurable waves. As they have been doing for 20 years. The geometry is dynamic and non-Euclidean. Fortunately the wave produced by the merger of 2 black holes was already modeled. Current time: 04-20-2019, 06:33 AM Powered By MyBB 1.8.19, © 2002-2019 MyBB Group.